The black blazer is a timeless item in my closet that can take me from day to night while either being the focal point for multiple looks, or the indirect statement piece. Here are a few of my favorite ways to style The Black Blazer. 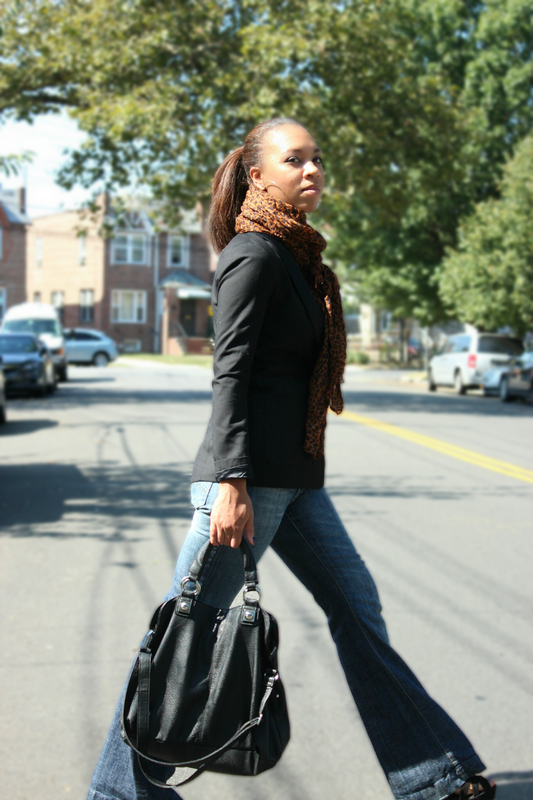 Casual – I love the look of wide leg jeans, a black blazer and a leopard scarf on a cool fall day. Edgy – Distressed jeans, studded booties, a white tee and a black blazer gives the comfy look a tailored edge. Night Out – All black with a pop of leopard. Sophisticated, yet trendy, simply by adding the black blazer. I highly suggest you invest in a nice black blazer to take you from season to season. My Black Blazer is from H&M (a few seasons ago) but, here is a similar choice I like as well. Comment about your favorite ways to wear a Black Blazer!